Same great formula and it now comes with a pump and in a bigger, family-size pack! 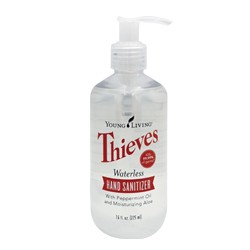 Enhanced with essential oils such as Peppermint and plant-based ingredients, Thieves Waterless Hand Purifier effectively cleanses and purifies hands. Also contains moisturizing emollients such as aloe vera for added hydrating benefits. Use as often as necessary. Apply a nickel-sized amount to the palm of hand and rub until completely absorbed. Alcohol denat, Water, Aloe barbadensis leaf powder, Glycerin, Hydroxypropylcellulose, Mentha piperita † (Peppermint) oil, Eugenia caryophyllus † (Clove) bud oil, Citrus limon† (Lemon) peel oil, Ecalyptus radiata† leaf oil, Rosmarinus officinalis† (Rosemary) leaf oil, Cinnamomun zeylanicum† (Cinnamon) bark oil.